Because of its many advanced and innovative features, the World War II German Panzerkampfwagen V, known as the "Panther" tank, is still considered by many ordnance experts as a weaponry masterpiece. 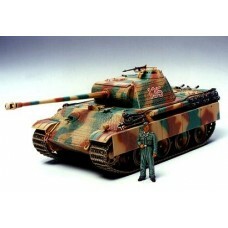 The development of the Panther came about due to the successes generated by the Russian T-34, which has become a serious threat to the German forces during the mid part of the conflict. Mass production of the Panther began during the spring of 1943, and with its sophisticated mechanics and powerful Type 42 L70, 70mm main gun, the Panther tank demonstrated its formidable strength during front line action shortly after its introduction. Several improvements were suggested following its initial employment, resulting in the Panther Type G, which began to appear in spring 1944. Major improvements consisted of additional side armour slope angles and simplified assembly refinements for mass production. The powerplant of the Type G Panther was a Maybach HL230-P30, V-12 cylinder, watercooled engine producing 700 horsepower. This powerplant was mated to an improved transmission in order to eliminate gear malfunctions found on earlier models. An innovative torsion bar suspension system and compound roadwheels enabled superb off road running ability. Major contractors MAN, Daimler-Benz, and MNH all tooled-up to manufacture the Panther Type G version during the latter part of the war, and these three produced 3,740 out of a total of 6,000 units produced by all firms.